Relic Raiders is adventure-filled online video slot machine game from Net Entertainment which has been released in April 2008. This video slot game has 5 reels and a massive 50 pay lines! 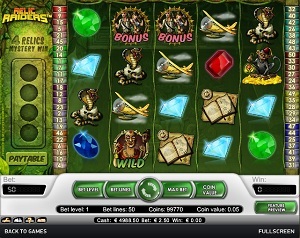 Relic Raiders is also the first of Net Entertainment’s slot games to have 4 rows instead of the traditional 3 rows. The theme of Relic Raiders is about a couple of relic hunters who are on a quest to find 4 ancient relics and reveal the ancient secrets kept by lost civilizations of long ago. What online slots players initially love about the Relic Raiders online video slots machine game is its easy-to-activate bonus games! Not only that, the bonus game also features multi-stages to make your stay more fun and interesting! When you first play this slot game, you will be taken to a world of treasure hunting, the most dangerous, mysterious yet lucrative professions known to man. Sure it can be very hard to find long lost treasures, but once you have managed to find them, the rewards will definitely allow you to live a very good, comfortable and luxurious life! Most online slot players agree that this game reminds them of the adventures of Indiana Jones; others can relate to this game with Temple Run in mind; while others say that the symbols used remind them of The Mummy movies. Net Entertainment is very generous when it comes to their wide array of online slots that they typically welcome anyone who is interested to play for free on any of their games (instant play), without requiring them to download anything at all. If you would like to join this slot game’s Relic Raiders on their exploits regarding their highly-profitable relic hunting exploits (such as a maximum cash jackpot of $20,000 and a maximum coin jackpot of 40,000) along the way, then you are very much welcome to do so in this wonderful, adventure-filled Relic Raiders online video slot game! What online slot players can expect from Net Entertainment’s Relic Raiders is that it is packed with fun and innovative animation graphics and sounds, and great bonus feature games to make sure that all those who play will totally be entertained with this online video slots game. The Relic Raiders, many online slots players loved this game immediately the moment they have laid their eyes on it! They say it’s very entertaining and there are many times that you get very lucky even if you have only deposited a low amount. The setting of this slot game is very much like what you will see in Indiana Jones, Temple Run, and The Mummy movies. The first thing you will notice is the intricate details created in and around the reels. Two pillars serve as pay line indicators while on the left hand side, you will see the Paytable and the 4 empty circles which are used during the bonus feature game. The symbols are drawn very intricately and it shows the complexity of the game. The overall graphic design of Relic Raiders displays a wide array of colors, with the main color being green. Other colors in the Relic Raiders online video slot game include red, pink, purple, orange, brown, blue, yellow, and of course, gold. As for the sound, Relic Raiders has a constant background sound of the rustling of leaves and other sounds that you may hear when you are inside a hidden cave or something like that. When you spin the reels, the sound of beads rattling and the beat of a drum will be heard after each reel stops. Whenever you hit a win, your rewards are accompanied by celebratory music that is usually played when someone founds hidden treasure. There are no card deck symbols available in the Relic Raiders online video slot game. The regular symbols used in Relic Raiders are the Plane, Treasure Map, Monkey, King Cobra, and precious gems such as the red Ruby, green Emerald, blue Sapphire, and the Diamond. The Wild Symbol is the Witch Doctor. It acts as a substitute for regular symbols in order to help you complete winning combinations. Multiple Witch Doctor wild symbols on an active pay line create winning combinations, which can be found in the Paytable of the slot machine. • The Treasure Chest Scatter Symbol: If you manage to get 3 or more Treasure Chest scatter symbols (that appear anywhere on the 5 reels), you will activate the Free Spin Bonus Feature game. The Treasure Chest scatter symbol does not need to appear in a line and on an active pay line for you to win. If you have a scatter win and a regular win, you are then paid out for both of these wins, because the Treasure Chest scatter symbol is not required to appear on an active pay line for you to win. Scatter rewards are entirely independent from pay line rewards, and they are included to the pay line win. • The Relic Raiders Bonus Scatter Symbol: If you manage to get 3 or more Relic Raiders Bonus scatter symbols (that appear anywhere) in consecutive order and on active pay line, you will activate the Treasure Hunt Bonus Feature game. Please take note that the Relic Raiders Bonus scatter symbols does not give out any winnings; however, they are your ticket to enter the Treasure Hunt Bonus Feature game. • Free Spin Bonus Feature Game – If you hit 3 or more Treasure Chest scatter symbols (found anywhere on the 5 reels), you will trigger the regular Free Spins bonus game. You will choose one Treasure Chest scatter symbol to reveal the number of Free Spins and multiplier value that you will win. While you are playing the Free Spin Bonus Feature game and you manage to get another 2 or more Treasure Chest scatter symbols, you will be awarded additional Free Spins or Multipliers! Simply choose a Treasure Chest scatter symbol to reveal the number of additional Free Spins or Multiplier value. The extra Free Spins you will get are then added to your remaining number of Free Spins. You can win an infinite amount of additional Free Spins in the Free Spin Bonus Feature game. When the Free Spin Bonus Feature game is over, you are then taken back to the main Relic Raiders online video slot game, and your Free Spin game winnings are included to your total balance. Note #1: The maximum multiplier value is 5x (times). • Treasure Hunt Bonus Feature Game – If you manage to get 3 or more Relic Raiders Bonus scatter symbol (that can be scattered anywhere) in consecutive order and on an enabled pay line, you will activate the Treasure Hunt Bonus Feature game. You will be taken to another screen wherein you will choose where you will go (to find lost treasures and relics) based on a map being presented to you. The Treasure Hunt Bonus Feature game is a multi-stage game where you will check out 1 of 4 locations of tomb sites: Angkor Wat, Luxor Temple, Tikal and Tintagel. You must find the Relic in each tomb site in order for you to be able to activate and play the Mystery Win Bonus Feature game. After you have found a relic, you cannot return to that location. Simply click on the Map to enter a tomb site that contains 8 urns. Break the urns with your pickaxe to reveal a bonus prize amount or the Relic. The Treasure Hunt Bonus Feature game will end if you happen to break an urn that contains a tarantula spider. When the Treasure Hunt Bonus Feature game is over, you are then returned to the main Relic Raiders slot game, and your bonus prize game winnings are included to your overall balance. Note #2: The Treasure Hunt Bonus Feature game can also be activated while you are playing the Free Spin Bonus Feature game; however, the Free Spin multiplier does not multiply the winnings that you have won during the Treasure Hunt Bonus Feature game. • Mystery Win Bonus Feature Game – Once you have successfully found all the 4 Relics, you will activate the Mystery Win Bonus Feature game. In the Mystery Win Bonus Feature game, you will be presented 4 Gold Statues wherein you will only have to click on one of the four statues in order to reveal your Mystery Win bonus prize. When the Mystery Win Bonus Feature game is over, you will be then taken back to the main Relic Raiders online video slot game, and your bonus prize game winnings are included to your overall balance. Note #3: The Relics you have gotten are saved for 36 hours from your last spin. Relic Raiders has 5 reels where you may bet on as many as 50 pay lines! Relic Raiders is the first of Net Entertainment’s online games to offer 4 rows (instead of the traditional 3 rows) in a slot machine. The minimum bet is 0.01 and the maximum bet is 0.50 per line. You may wager from 1 up to 4 coins per pay line. It’s totally more fun and easy when there’s an Autoplay function available in online slot games. In Relic Raiders, you can actually access their Autoplay function by clicking on the Autoplay button on the lower left corner of the screen. Relic Raiders can be automatically played as complex or as simple as you would want it to be. In its simple settings, you can choose from 10 to 1000 – these are the number of spins that the game can automatically play for you. If you would like to use a more complex Autoplay setting, just click on the Advanced Settings button and choose to Stop Autoplay: on any win, if Free Spins is won, if Bonus Game is won, if a single win exceeds an amount you specify, or if your cash decreases or increases by an amount your specify. When you are completely satisfied with fine tuning your Advanced Settings, just click the Start button and the Autoplay function will automatically help to spin the reels for you.